Following is a collection of recipes for authentic German cookies, cakes and other desserts baked according to centuries-old traditions. German Christmas specialties, in particular, are well-known and popular worldwide. Many have a rich and colorful history, and are crafted into complex patterns and shapes often associated with ancient symbolic meanings. The following recipes reflect these authentic traditions, even when adapted for the modern kitchen. Enjoy! An East German cake with Latvian roots with raspberry jam sandwiched by shortcake garnished with a sugary lemon glaze. Delicious mix of nuts, chocolate and fruits. Makes a great cake to serve in the afternoon or birthdays. Rich and flavorful almond cherry soufflés are virtually fat free. Served with a warm German chocolate sauce with just the right amount of sweetness. A classic German Christmas cookie with an embossed design. A whiskey tumbler filled with chocolate cake, caramelized apples, vanilla pudding and whipping cream makes a great dessert for the winter holiday season, especially a New Year’s Eve party. Rosehip preserves lend these apple puff pastry stacks a sweet tang, softened by whipped cream. Hazelnut, vanilla and white wine enrich the flavor. This easy, simple version of traditional German Apple Strudel gets a head start by using store-bought phyllo dough. These cooked apples hide a liqueur-flavored fruit cream inside. Apple cake baked on a zwieback bottom crust with almonds and pistachio topped with an apricot preserve glaze. A simple dessert with blueberries and Manner Wafers mixed into a creamy apricot quark. Sweet baked apricots infused with cherry brandy, adding a nice contrast to their creamy blue cheese filling. An easy and festive dessert featuring apples baked with a filling of seasonal ingredients such as German marzipan, cranberries, and spices. Baked apples stuffed with chocolate and crumbled German gingerbread (Lebkuchen), garnished with whipping cream and crystallized ginger. A holiday treat! Bake a home version of the classic multi-layered cake. A buttery brioche cake with a caramel cream, named Bee Sting because it is glazed with honey just before baking. Berlin’s version of a “royal treatment”– a winter dessert featuring currants, raisins and candied lemon peel. German jelly-filled donuts, sold year-round at bakeries, but also a must-have staple during Karneval season. They are called Pfannkuchen in Berlin, Kreppel in Hessen, Krapfen in Southern Bavaria and Berliner just about everywhere else in Germany. Succulent, fruity cake with shortcrust pastry, marzipan creme and topped with bilberries or blueberries. One of Germany’s most famous cake creations known all around the world, made with sour cherries, whipped cream and a chocolate cake base. Cherry flavors from the Black Forest abound in this custard, flavored with Kirschwasser (cherry brandy) and topped with pureed, preserved Morello cherries. A parfait (layered ice cream dessert) with flavors of Germany’s Black Forest – cherries, raspberry preserves, and dark chocolate. The addition of blue cheese and walnuts to the winter seasonal favorite baked apples make a comfort food with bold flavors. Cookies with eggs, cinnamon, and lemon, with sweet hazelnut topping. This German sheet cake from Bremen is also known as “Zuckerkuchen” and is a favorite dessert at weddings, funerals or simple afternoon Kaffeeklatsch hours. This light sorbet brings together the great flavors of sour cherries and currants, supported by a hint of Creme de Cassis. A wonderful cold fruit soup based on dark red sour cherries spiced with vanilla and cinnamon, garnished with little cream of wheat dumplings. A stunning dessert for holiday entertaining with colorful layers of shaved German pumpernickel, dark chocolate, cherries and flavored quark. Make a light textured dark chocolate cake in the shape of a sponge flan base. Top with whipped cream and quark and either fresh raspberries or cherries in syrup with a little thickened juice from the fruits. This is an elaborate recipe, but with a spectacular result and layers of exquisite flavors! Superb. Fantastic crunchy oat snacks with chocolate and almond. Very easy to make, these chocolate oat crisps bring out the chocolate flavor and add the healthy properties of oats. Fruit and Manner Wafers mixed into a delectable chocolate pudding. A German chocolate almond pumpernickel pudding served with homemade spiced apricot raspberry compote. Rich and delicious! German chocolate quark cheesecake with a chocolate brandy cream glaze. Chef Olaf Mertens combines dark chocolate and well-flavored German sauerkraut to make a cake for fans of novel tastes. Use dark, organic chocolate for this indulgent soup created by Nic Prong, the your head chef at the “Ten Restaurant” in Ontario. Sinful chocolate cherry bliss! Black Forest cherries stuffed with chocolate covered espresso beans, served with mint leaves, whipped cream and Kirschwasser (cherry brandy) Coulis (a thin fruit puree used as sauce or topping). The quintessential Christmas cookie – crisp, cinnamon almond cookies cut into stars. Classic macaroons with a crunch of coconut. Wonderful tasting cookies with tart cranberries, full-bodied macadamia nuts and a healthy dose of oat cranberry muesli. Easy to make and great for an afternoon snack. Raspberries and blackberries flavor the crepes and the filling in this dramatic flambé dessert. The forest berry flavors are reinforced with citrus and fruit liqueurs. Delectable pastries frosted with a burst of lemon flavor. These sweet, succulent honey-nut-oat cookies look great with white and dark chocolate swirls and are the grand finish of a great meal. Potato-Rusk dumplings with juicy plum filling are a favorite Southern German dessert. Served with vanilla sauce. Delightful cupcakes with German flavors of dark chocolate, cherries, and cherry brandy (Kirschwasser). The bright pink frosting over chocolate makes them a perfect Valentine’s Day treat. This East German version of a Christmas classic is fragrant with butter, candied fruits, raisins, a little rum flavoring and dusted sugar. European law protects the origin of this historic specialty treat. Egg custard cake with a pie crust, vanilla quark layer, and egg-flavored top layer. A staple at Dresden cafes, it pairs deliciously with coffee. German dark chocolate gingerbread cake full of deep, rich flavors looks great baked in a bundt pan and dusted with confectioners sugar. A festive-looking cake with a filling of cherries and cherry brandy, decorated with a creamy icing. Popular German crullers, these star-shaped deep-fried donuts are coated with powdered sugar and lemon juice or rum. Classic German Christmas treat from Mecklenburg with sweet egg and lemon flavors. Chocolate-covered waffle rolls decorate the outside of this creamy favorite. Irresistible jam-filled Christmas cookies shaped like stars, hearts, or rounds. The round ones are also called Little Rascals (Spitzbuben). Traditional Tiramisu with a twist. A wreath-shaped butter cake from Frankfurt, with a buttercream filling and sprinkled with Krokant (nut brittle). This holiday specialty cake is a little elaborate but visually spectacular with layers of flavors and decoration. Gingerbread or Lebkuchen combines the flavors of oriental spices and nuts with the world-class German baking skills. A must-have for the holiday season! The classic Christmas cookie recipe based on century-old baking traditions from Aachen and Nürnberg. Sweet and richly spiced, German Christmas Ginger Lebkuchen cookies with chocolate and sugar glaze. A wonderfully fragrant, flavorful Christmas treat. A recipe or homemade traditional German Lebkuchen, a flour-less spiced, soft gingerbread cookie baked on a wafer, with recipes for sugar and chocolate glazes. Cookies made of whole hazelnuts, flavored with a gingerbread spice. 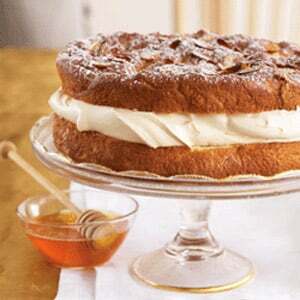 A light hazelnut and walnut cake baked in a ring and decorated with simple glazing. These macaroon cookies use hazelnuts instead of usual coconut. Topped with a whole hazelnut and baked on German thin baking wafers (Oblaten), they’re a great German Christmas cookie. A quick and easy dessert made from leftover German Christmas gingerbread (Lebkuchen) and chocolate ice cream. Cherry jam-filled almond cookie sandwiches decorated with drizzled melted chocolate. An elegant Christmas cookie with layers of flavor. A traditional sweet dessert from the South West corner of Germany. Leftover, dry bread rolls are combined and softened with milk, egg and sugar, flavored with vanilla, cinnamon and nutmeg, and spiked with sweet or sour cherries. Baked in the oven, this sweet casserole completes a dinner. A classic German variation of a gingerbread cookie to make ahead for your Christmas cookie bin or stocking gifts. The dough needs to ripen overnight before baking. German carrot cake with chocolate frosting, a 19th century specialty made with carrots, almonds, rum and cinnamon. A pastry from Saxony made with a short crust, almonds, brandy and apricot jam, originally shaped like birds to satisfy the Saxon appetite for small fowl. Pure ground almonds and lemon zest flavor these heart-shaped cookies which are then iced and decorated with colorful candies. A fluffy lemon cake that is perfect for any occasion. Macaroons made with marzipan and coated with rich chocolate. A classic muffin recipe with a nice crunch of Manner Wafers. Make this recipe in early summer, so it’s ready around Advent or Christmas. A traditional German holiday dessert of fermented fruits. Recipe courtesy of Roz Denny, Modern German Cooking. Made with fresh German marshmallow chocolate treats (Schokoküsse). An exclusive recipe from Chef Alexander Haebe, Mandarin Oriental Hotel, Washington DC. A splendid layered cake made with three fluffy biscuit layers, filled with vanilla-flavored whipped cream and topped by a chocolate-marzipan glaze. This biscuit roll is filled with a nutty nougat cream and a marzipan-rum cream, then topped with sweet apricot glaze. These marzipan treats greet the Christmas holidays in black and white, covered with chocolate or sugar glaze. A Saxon version of the famous cream cake, yet with a much lighter filling of quark, a curd cheese. A stunning homemade meringue wreath with rhubarb cream and garnished with strawberries. Perfect spring combination of sweet and tart flavors. Individually portioned cheesecakes with a German gingerbread cookie base and an apricot compote on top. Lighter then most cheesecakes, this is a great way to use leftover Lebkuchen from Christmas and serve during the months of late winter and early spring. Morello cherries marinated in lightly spiced wine and Kirschwasser (cherry brandy), nestled in an airy butter cheese soufflé. Makes for a delightful contrast in flavors and textures. Christmas gingerbread house in the shape of a townhouse with a garage and starry sky. Traditional flavors, modern architecture. Golden glazed apple slices baked with almond and fruit liqueur in a sweet cake dough shell. Apple Cake recipe from Germany’s capital with rum and raisins. Plum Cake recipe with ground walnuts, butter, and sugar. This pastry named after its place of origin, is a delightful blend of fruit and delicate pastry. A most unusual ice cream flavored with pumpernickel bread and German chocolate, served with cranberries. A raspberry jam-filled rolled cake perfect for the spring and summer months. This fast and easy recipe balances tart rhubarb flavors with sweet raisins in a simple sheet cake that is a spring favorite in Germany. Using wine, gelatin, and rosehip jam a light mousse is formed. One of the most popular German summer desserts, this recipe combines the flavors and textures of several fresh summer berries. Serve in dessert glasses with vanilla sauce, whipped cream, or ice cream. Erfurt Stollen with raisins, almonds, lemon, brands or rum. A staple at the Erfurt Christmas Market, the stollen cake dates back to the 14th century. A vanilla ice cream dish that looks like spaghetti, topped with a strawberry or cherry coulis (sauce). Honey gingerbread flavored cake squares with crushed hazelnuts, a casual and tasty year-round dessert or after school snack. Simple gingerbread square are brushed with wild flower honey and decorated with ground walnuts. A great German Christmas cookie based on traditional Lebkuchen. Delicious poppy seed concoction somewhere between a pudding and a cake. A German Christmas cookie with a buttery hazelnut, almond and other tree nut base and commonly shaped like the letter ‘S’. Traditional Christmas Stollen fruit bread gives this delicious bread pudding a nice touch. Great for using left over post-holiday Stollen. A stunning bread pudding with brandy, chocolate and caramelized bananas for holiday dessert or brunch. German Christmas Stollen made with bread pudding easy and delicious, because they already come flavored with currants, almonds, orange zest and cinnamon. Classic strawberry-rhubarb flavors in a German-style trifle, with layers of meringue, rhubarb cream and fresh strawberries. Spring strawberry tartlets combine a white wine flavored creme fraiche (or sour cream) with fresh sweet strawberries. Similar to cherry pie with the addition of crumble (streusel). An East German chocolate frosted cake favorite, bristling with almonds to look like a wild deer hide. A lemon cake with a filling of whipped cream, tangerines and coconuts makes a perfect summertime cake. Homemade cherry ice cream, with a hint of brandy.